Twenty nine years ago, Singapore took on Iran twice in the Asia Group Three pre-Olympic Games qualifying competition. Singapore and Iran aside, the other countries in the tournament were India, North Korea, Sri Lanka and China. All the teams had to face one another in a round-robin format. Subsequently, the top two teams at the end of the round-robin matches will face off in a final, with the winner clinching the sole qualifying ticket to the Olympics. Singapore lost 0-3 to Iran in its round-robin match. However, the Lions captured the nation’s imagination when it defeated giants North Korea 3-1 and China 1-0. Singapore also defeated Sri Lanka 3-0 and India 1-0 to finish second in the group and earn a final play-off against Iran. On the other hand, Iran got its campaign off to a slow start when it drew 0-0 with North Korea and 2-2 with China. But it defeated India 2-0, Singapore 3-0 and then smacked Sri Lanka 11-0 to finish top of the table. In the final, Singapore,s despite a 60,000-strong crowd, proved to be no match for the Iranians who romped home 4-0. 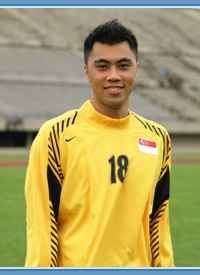 Goalkeeper: Edmund Wee. Defenders: Jeffrey Lazaroo, Syed Mutalib, Hasli Ibrahim, Samad Allapitchay. Midfielders: Lim Tang Boon, Hashim Hosni, Rahim Hussein. Strikers; Wong Kok Choy, Mohammed Noh, Fandi Ahmad. Fast forward to 14 Jan 2009. Singapore took on Iran in their opening Asian Cup Group E qualifying competition in Teheran. And subsequently lost 0-6. The result is national coach Raddy Avramovic’s second biggest trouncing since losing 0-7 to Oman in 2004. Goalkeeper: Lionel Lewis. Defenders: Precious Emuejeraye, Daniel Bennett, Ismail Yunus, Baihakki Khaizan. Midfielders: Mustafic Fahruddin, John Wilkinson (who was subsequently replaced by Agu Cashmir), Isa Halim and Shahril Ishak. Strikers: Indra Sahdan (who was subsequently replaced by Muhammad Ridhuan) and Noh Alam Shah. How was it that back in 1980, an all-local Singapore team still managed to stop Iran at four goals, whereas our modern-day Lions team, which included five naturalised citizens, just collapsed 0-6 to Iran? What does it say about the playing standards of our Lions? Has it deteriorated that badly over the past three decades, that we end up being slaughtered by Iran, even with foreign talents on board. What does this say about the quality of our naturalised talents? Are some of them really that good or have they been appearing to be good players because they have been performing in a sea of S-League mediocrity all this while? Finally, I really shudder at the thought of what the score would have been like if we had fielded a team made up of only local, natural-born Singaporeans against Iran. I think the score would have been 9 or 10-0. This is one of the reasons why the Foreign Talent Scheme can be so deceiving. The Football Association of Singapore has clearly used it to paper over the cracks and hide the harsh truth of the situation: that local footballing standards are really abysmal without the help of imported foreign talents. Singapore lost 0-1 to Vietnam in the second leg of the AFF Suzuki Cup sem-final at the National Stadium tonight. The result means that Vietnam will now advance to the final after holding Singapore to a 0-0 draw in the first leg in Hanoi a few days back. Vietnam clinched the final berth after Nguyen Quang Hai scored the winner in the 76th minute. The result means that Singapore – champions in 2004 and 206 – has now lost the chance to become the first three-time winner of the Asean Championships. SINGAPORE : Vietnam advanced to the final of the AFF Suzuki Cup after defeating Singapore 1-0 in the second leg semi-final at the National Stadium on Sunday.Vietnam and Singapore had played to a goalless draw in the first leg semi-final on Wednesday. Singapore‘s heroics came to naught when Vietnam‘s Nguyen Quang Hai scored in the 76th minute.Vietnam good luck in the final.”Vietnam will play against Thailand in the final. It was a sea of red at the National Stadium as the home crowd turned out to support their team. The game started off fast and furious in the early stages, with Noh Alam Shah attempting two near goals within the first 10 minutes. But tempers flared as the match got more tense with Shah and Shahril Ishak receiving yellow cards. Quick thinking by Pham Thanh Luong saved the Vietnamese side from scoring an own goal. But intense pressure from both sides resulted in the first half of the match ending in a goalless draw. 1. It was an evenly-fought game but Vietnam, in my opinion, came out the deserving winner because of the attractive flowing football they dished out. The goal they scored in the 75th minute was a fitting example of the sort of stylish football they played. On a quick counter-attack, a wonderful exchange of passes resulted in striker Le Cong Vinh eventually speeding down the left flank and shimmying his way past Ismail Yunos into the box. He then cut a pass across the face of goal as goalkeeper Lionel Lewis desperately came out to cover the angle. And all an oncoming Nguyen needed to do after beating a lumbering Precious Emuejeraye for speed and entering the box, was to tap the ball into the empty net. 2. My man of the match though was Noh Alam Shah for playing with so much heart, fire,spirit and determination. And when the final whistle blew, I just felt so sorry for him. And despite his irritaing time-wasting and injury-feigning tactics, Vietnam goalkeeper Duong Hong Son came a close second behind Alam Shah with his commanding display beween the posts – and for that hat-trick of saves he pulled off in the 84th minute. He first incredibly kept out Mustafic Fahrudin’s header with a one-handed save before recovering quicky to swat the loose air-ball away before Mstafic could head it again. The oose ball fell to Muhammad Ridhuan who sent a cross in – and Duong was there again to punch it away to safety. On the other hand, Agu Cashmir was truly crap. So was Precious whose lack of speed and slowness on the turn were once again clearly exposed by the Viets. One just cannot help feeling that these two naturalised citizens, supposedly among the best players in our local S-League, are gradually passing their prime to the point that they are no longer the sort of players that the Lions can count on for the big games. One comes away with the impression that they are only able to shine against minor sides like Laos and Cambodia and don’t have the skill to play against tougher teams. 3. Before the game, The New Paper quoted Vietnam coach Henrique Castilo as saying he did not like Singapore’s long-ball tactics. Truth be told, I didn’t like them either as I watched the game tonight. Singapore’s play was so one-dimensional and clueless that it seemed as though the Lions didn’t know how else to play except by hoofing the ball into the Vietnamese final third and then hoping for the best. It was like watching Wimbledon in action in the early 1990s. In light of how the Lions played tonight, Castilo’s words certainly had the bitter taste of truth about them.